Little has been published on the subject of energy-efficient refurbishment of offices, despite the growing need to refurbish older office building stock throughout Europe, and the global requirement to conserve energy. 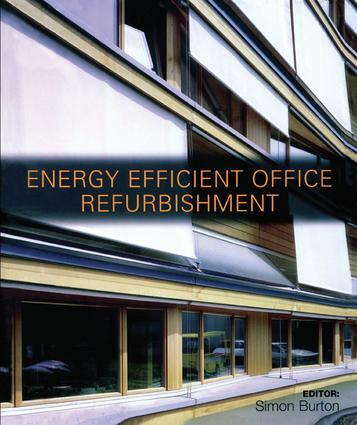 The book suggests the most energy efficient and environmentally friendly way to refurbish offices using examples of real buildings and designs wherever possible. Each case study includes a building description, the retrofitting strategy, passive and low energy technologies used, energy assessment, comfort and environment assessment, financial assessment, client and market assessment, and conclusion. This practical design manual will be invaluable for architects and engineers specialising in the refurbishment of commercial buildings.